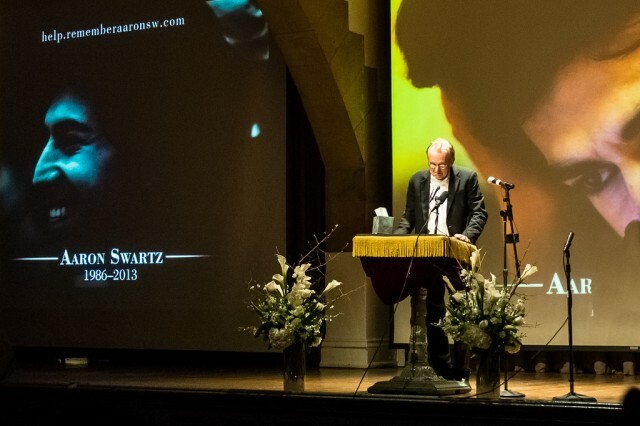 Edward Tufte speaks at Aaron Swartz’s memorial on Jan. 19, 2013, in Cooper Union, NYC. There were many powerful speakers during yesterday’s memorial for Aaron Swartz in Cooper Union. Among them was data-visualization pioneer Edward Tufte, whom I hadn’t known had ever collaborated with Aaron. But given their similar orbits in democracy and data, it is not at all surprising that they were friends. Note: A commenter has pointed me to a full version of Tufte’s talk. I’ll update with his full comments when I have time. The archival video feed cut off here and I can’t find the missing excerpt on Democracy Now’s website. From what I remember from being at the memorial, in this part, Tufte related how he told Aaron, half-seriously, that Aaron’s main fault was downloading millions of articles when only a few thousand were worth downloading. Tufte then said that Aaron asked him if he knew Bill Bowen, the former president of Princeton University and the founder of JSTOR, the digital library that Aaron was accused of illegally accessing. …[Bowen] then became president of the Mellon Foundation and he had retired from the Mellon foundation. But he was asked by he foundation to handle the problem of JSTOR and Aaron. So I wrote Bill Bowen an email about it. And I said first that Aaron is a treasure. And then I told a personal story about how I had done some illegal hacking as a student and had been caught at it and what happened. In 1962, my housemate and I invented the first blue box. That’s a device that allows for free, undetectable, unbillable long-distance telephone calls. And we got this up. And played around with it and at the end of our research came when we completed was what we thought was the longest long distance phone call ever made, which was from Palo Alto to New York time of day, via Hawaii. Well, during our experimentation, AT&T, on the second day it turned out, had tapped our phone. But it wasn’t until about six months later when I got a call from a gentleman, A.J. Dodge, a senior security person at AT&T. And I said, “I know what you’re calling about”. And so we met. And he said what we’re doing is a crime…But I knew it wasn’t serious because he actually cared about the kind of engineering stuff and complained that the tone signals we were generating were not up to standard. Because they recorded them and played them back into the network to see what numbers we were trying to reach and they couldn’t break through some of the noise of our signal. He asked why we went off the air after about three months…And I said, well, we regarded it as an engineering problem and we made the longest long-distance telephone call…and that was it. And so the the deal was, as I explained to my email to Bill Bowen, was that we wouldn’t try to sell this…we wouldn’t do any more of it, and that we would turn our equipment over to AT&T. And so they got a complete vacuum oscillator kit for making long distance phone calls. But I was grateful for A.J. Dodge and, I must say, even AT&T, that they decided not to wreck my life. And so I told Bill Bowen that he had a great opportunity here to not wreck somebody’s life. And of course he thankfully did the right thing. Aaron’s unique quality was that he was marvelously and vigorously different. There is a scarcity of that. Perhaps we can be all a little more different too. This was the first that I had ever heard of Tufte being associated with phreaking. It’s not that he wouldn’t have the technical chops…it’s just that I couldn’t find any reference to it in the exhaustive articles that have been written about him. Eric Hellman, who also attended the memorial, said he chatted with Tufte afterwards who told him he had never talked of the incident in public. After listening to Tufte talk, I Googled for any reference of him and Swartz. Here’s Swartz, “a loyal fan,” asking Tufte about the font he uses. And here’s Swartz describing a Tufte lecture. Watch the rest of the recorded memorial at Democracy Now’s website. The message from Taren Stinebrickner-Kauffman was especially poignant and inspiring. This entry was posted in thoughts and tagged aaron swartz, Edward Tufte on January 20, 2013 by Dan. Here’s what appears to be the full memorial. It includes the segment you are missing. Just as a point of historical accuracy, it should be noted that Edward Tufte, regardless of his claim, did _not_ “invent” or create the first blue box. According to the new book, “Exploding the Phone,” by Phil Lapsley, on the history of phone phreaking from 1960 to 1980, notes it was Ralph Barclay. Barclay, an 18-year old college student at the time, was walking through the engineering library at Washington State College when he spotted the November 1960 issue of the Bell System Technical Journal (BSTJ), which had only been out for a week, and when Barclay noticed on the cover of the journal an article entitled “Signalling Systems for Control of Telephone Switching,” he became very intrigued. In that seminal article, which was almost the first (and certainly most detailed and revealing article) AT&T/Bell ever published on the new in-band, multi-frequency (MF) signalling system AT&T had just begun to implement a year or so beforehand, the BSTJ laid out the frequencies of the dual-tone or MF pairs for each dialed number, and how AT&T long-distance operators would also use “ST” and “KP” audio signals to make long-distance toll calls for customers from their semi-automated switchboards. Bell even published basic schematics in that article for the signalling circuitry involved in generating the MF tones used over the voice circuit to make toll calls. D’oh! Thus, Bell itself publicly exposed the “billion-dollar flaw” in their newly implemented switching and signalling system, as the BSTJ was commonly available through most college engineering and other university libraries. Barclay, a rather bright and insightful lad, apparently, had then gone on, after reading the article noted, within a month to create a duplicate of Bell’s signalling circuitry using analog components to fabricate the first known “blue box,” and to make unlimited, free long-distance phone calls. So, Barclay was actually the first, and by December, 1960 was using his blue box to make free phone calls. [BTW, since Tufte was studying, at that time (1962 — 1968) political science and statistics, not a hard science like engineering or electronics, I wonder if his “housemate” may have had more to do with the alleged “invention” of the blue box Tufte claims in 1962 than Tufte did. Plus, the supposedly “longest long distance phone call ever made, which was from Palo Alto to New York time of day, via Hawaii” is also dubious, since that was not possible, considering the long-distance tandem links domestically. One would have had to employ a technique that was only discovered in the early 1970’s by the phreaks called “guard-banding,” which employed a multi-frequency combination of 3200 and 2600 hz using a potentiometer on a blue box to gradually modulate the mixture of those two tones to do what was called “tandem stacking,” which was certainly not known of or used in the early 60’s by any “telephone enthusiasts” or phreaks, as we were known.